Who's going and should we organize a car camping subgroup there? We could learn a lot from each other. 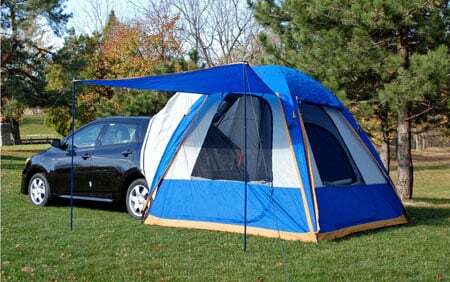 I'll be going in my Prius with attached tent. For the last 4 years David has organized a small vehicle show-and-tell during one of the afternoons of the RTRs. So, watch for that as a time to gather. As for trying to camp together, we're all so independent that would be a real challenge to organize. But, once you get there, it's fun to walk or drive around, visit, and count how many Prii you see … I spied at least 15 last January … and I use to be the only one for the first several RTRs. That's a pretty cool tent. I can't quite tell from the picture, but it is attached to the back of your car? Where did you get it? (09-15-2018, 08:54 PM)Suanne Wrote: Welcome to the forum! Thank's Famous Suanne, I'll look for it. (09-15-2018, 09:51 PM)dawnann7 Wrote: That's a pretty cool tent. I can't quite tell from the picture, but it is attached to the back of your car? Where did you get it? Yes it goes over your open hatchback, it's like adding a living room to your car. I didn't have a picture of mine, so I just copied a stock image off the web. Here's a link to the one in the photo. I actually bought one from walmart for a lot less money but it doesn't fit the Prius as well as this one, but I make due. I have a Subaru.. I have no idea how to store in it. Should I took out the front seat? I was thinking about buying a tent, but I was wondering if it would be to cold. HELP!!! I'm going with a Springbar Or Kodiak tent on May 1st. I wouldn't mind meeting up with other car/tent dwellers. Nice set up kygreg! (09-16-2018, 08:42 AM)ladeeblaze Wrote: I have a Subaru.. I have no idea how to store in it. Should I took out the front seat? I was thinking about buying a tent, but I was wondering if it would be to cold. HELP!!! I have a small SUV and a tent too. Trying to research stuff to help keep warm. Also thinking about buying a hitch cargo carrier to help carry all my essential needs. Though, as previously mentioned, arranging it might be kinda like herding cats, but this being a great gathering for learning from each other, camping in groups with similarly equipped folks would make for a fairly convenient way to share tips/tricks/etc. related to that particular mode. (09-15-2018, 05:17 PM)kygreg Wrote: Who's going and should we organize a car camping subgroup there? We could learn a lot from each other. Good idea. In 2018 RTR I had to walk 15 min round trip to use porta potty. Maybe we can have a little area not too far from the potties for car campers? It wasn't windy when I attended last RTR.